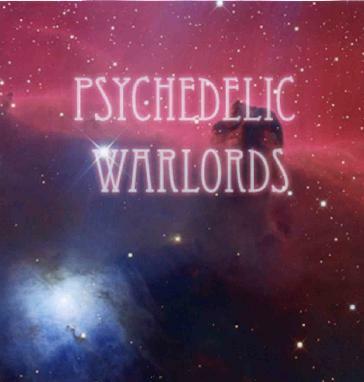 Psychedelic Warlords - "Demo 2008"
Psychedelic Warlords are a new instrumental space rock band from the Norrköping area of Sweden. This 5 track demo was recorded in the studio as improvised jams in July 2008. The band on this recording is: Kristoffer "Hylfe" Larsson: Bass, Guitar, Electronic; John Säfström: Guitar, Saxophone, Harmonica, Electronic; K-G Jonsson: Drums, Prec; Kenny from Levitation on Guitar. With a name like this you would expect them to really sound like Hawkwind, but not really. They play really laid back, stoned and space music. Parabola Asteroider starts the trip with 9 minutes of slow and spacey noodling that slowly builds up and gets more out there. Swallowed by the Black Mole is nearly 11 minutes long and starts off very slow and spacey with no real drums for the first few minutes as the delay guitars slowly come together. This jam stays way out there and is a slow noodler. Not a lot happening really. The Space is Crowded and the Crowd is Spaced are the two next tracks. Things pick up now with a heavy bass line and a more distorted and quite cool guitar that drives things and it is lead by some quite nice lead guitar that sounds like a keyboard at times. Psyched out ending that leads into the Crowd is Spaced. This track has a lot more space sounds and experiments happening in the background while the melodic bass and guitars still take the lead. You get sucked into this one... nice. The CD ends with Cosmic Desert. Almost 10 minutes of spacey noodling. This music is best when stoned or very relaxed and then you can just trip with the band. I look forward to the next journeys.